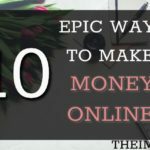 Home » Make Money Online » 10 Money-Making Hobbies For Stay At Home Moms! Are you a Stay at home mom? Are you looking for a hobby? Do you wish to know top notch hobbies that could actually help you earn cash? We all sometimes have a busy schedule where we get caught up, and we tend to forget the thing that we are most passionate about. We make our passion take a backseat. So, here’s an article on hobbies. Especially for women, This is a gentle reminder to all the women who have god knows how many responsibilities lined up for them on a day to day basis. This article will help you get to know your hobby or interests and will also probably help you earn some cash out of it. Let’s start with the list, shall we? List Of Articles To Help You Make Money Online! Start Surveying and earn instant cash! 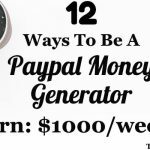 Become A Paypal Money Generator! 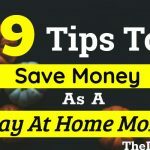 Save money as a Stay At home mom! Lucrative Business ideas for moms! Tips and tricks on How to start a blog! Start Journaling! It could be about anything. You could vent, or you could channel your thoughts. This is a good way to deal with anxiety or even depression. Journaling is advisable to anyone who is dealing with mental health issues. Although even if you don’t have any issues, you can always aim at having healthy mental health! Journaling you can either pursue the traditional way of having a book or you could go digital. Whatever works for you. This one is kind of a budget-friendly idea! It’s quite popular amongst woman as well. Everyone is born with some hidden talent. Yours might be calligraphy! Why not give it a shot? It could be challenging at first, but once you get a grip on the art, I think you will pretty much ace this hobby. All you require is a set of brush pens which can cost you anything under $20. Minimal expense if you ask me. You could look for tutorials on youtube and gain knowledge or go to Udemy and learn from there in detail. Succulent Gardening is the easiest of all. It’s not hard to deal with. I have heard all good things about it. If you’re a stay at home mom, then this could be a fun hobby for you to share with your kids as well. Succulent Gardening doesn’t require much watering as well. If you’re not into taking a lot of fuss about this, then this is your go-to because this hobby is quite low maintenance. You could gradually own a whole nursery. It’s that easy! This one is quite famous amongst the ladies! Knitting is quite lengthy and challenging if you ask me. But it is worth pursuing. Crocheting, on the other hand, is simple and a little faster too. I mean yes people will always prefer a knitted sweater over a crocheted sweater but like I said it’s up to you. You could choose either of them as a hobby. I mean at the end of the day it’s going to feel good to be able to create something good on your own. It’s well appreciated to turn a ball of yarn into a sweater! This one is a bit unusual choice! To all the geeks out there! This one is for you! This one would be my favorite amongst the list! It’s budget friendly too. You might have given it a go earlier but just taking a glance might have been intimidating for you. But trust me I am no expert on the said topic, but it does get easier once you start learning about it in detail. Like, take crash courses or online courses on coding! It will be fruitful in every aspect! This one is probably the most basic and common hobby in the entire universe! Like who would dislike reading? Not a single soul on this planet would want to shy away from reading! Reading imparts knowledge, but it also helps you gain serenity. So if you’re working mom or a stay at home mom or homemaker, this one could help you in a million ways and is the most budget-friendly idea for a hobby! Give it a try! Like you could go for Kindle or the library or audible! Exercise is the key to peaceful mind they say! But I beg to differ! Yoga helps you achieve that at a much faster pace! Yoga is something everyone should take on as a habit daily. Yoga helps you mentally as well as physically. Yoga helps you with anxiety, mood swings or breathing issues or back pain, etc. Yoga can help you regain your focus too. Yoga is fruitful in numerous ways. You can either hire a yoga instructor and learn it in depth and traditional way. Or an easy solution would be to follow it up online. Maybe try youtube and start small! This could be budget friendly! This hobby is more like getting procrastination out of your system. Who would hate cooking? Cooking helps you stay organized. For a mom, this turns out to be a daily job. But cooking or baking can be for fun too. You can learn new recipes in your free time. You could try different cuisines. You never know you could have a hidden talent worth becoming a baker or opening a restaurant! If you won’t pursue, you would never know! Baking goodies can be a new way of bonding with your kids! So, why not give a try? Scrapbooking is fun and stress eradicator! It gets the artistic abilities out of you! Imagine you had a long day at work you come home you are tired and are looking to relax. Well, this could help you have that. You can also scrapbook with your kids. Teach them a thing or two and introduce them to an art form. You can buy markers and a book or if digital is your thing then go for that as well. Photo books, on the other hand, is more of a leisure activity. You could be looking for storing memories in a fun artsy way then this is it! You could create a personalized photo book for yourself and your family! Photo books can have different themes, and you can experiment with them all you want. You could create your own timeline. Photobooks are also a fun way of bonding with your loved ones. Do I even need to tell you about this? I mean this is one of the easiest and the most promising one in the whole list! Blogging is not only a key to success but key to happiness! If you want to start your own blog, there are plenty of niches that are available for you like fashion, health, lifestyle, affiliate marketing, food, self-help, etc. Pick one and start your blog. Plus it will be quite flexible, and your schedule won’t be like a 9-5 job! After all, you’re your own boss! If you’re a mom, who has a lot of responsibilities you should definitely consider this as an option! The common misbeliefs: “I am not a tech-savvy person” or “I don’t have the investment that it takes” etc. are not valid. If you’re a person who knows his way around basic internet workings or can put his ideas into content, then you’re very much capable of coming up with your blog. Waste no time and start writing! The above list I curated with the intention to provide every woman whether stay at home mom, a homemaker or a working woman or a working mom with few hobbies to look forward to. These hobbies are quite budget-friendly, and one can easily follow through if pursued with enough dedication. My primary motto here was to provide you with a list of hobbies. But if you pay attention closely each and every hobby on this list can be turned into a new side hustle. Let’s say for example calligraphy. You learn it and ace it. You start your own online tutorials, or you create art pieces good enough to start art shows. In a way, you turn your hobby into a new side gig! Thereby creating an income and contributing financially in your family. Think about this! Hope you find the right path! Happy Reading!